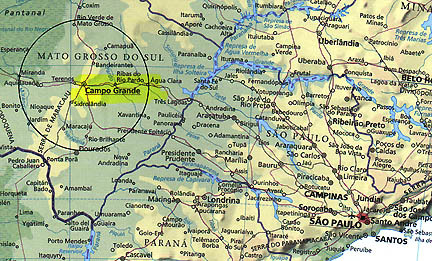 The location of Felipe Branco's 1999 encounter 100 kilometers outside Campo Grande was in Corguinho north of Terenos in the state of Mato Grosso Do Sul, along with five other people including Urandir Oliveira, with disc craft and three tall, blond-haired beings. The foreheads of the blond beings lighted up andpulsed light. Mr. Oliveira's forehead also lighted up and pulsed as if in telepathic response. 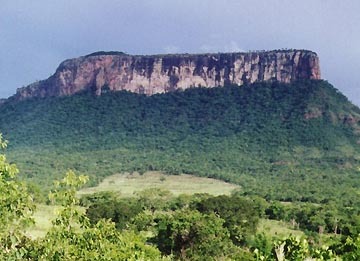 Two hours by truck northwest of Campo Grande is the small farming community of Corguinho, dominated by the flat-topped mesa. Photograph © 2002 by Flavio Mori, Jr.
December 21, 2002 Campo Grande, Brazil - Brazilian businessman, Felipe Castelo Branco, is an executive in his family's company, Castelo Branco Ltd. - a ranching and holding company with offices in Rio de Janeiro, Campo Grande and Italy. Mr. Branco has taken a deep interest in researching UFOs and close encounters with what seem to be non-human beings since his own first experience with a tall, red-haired, green-eyed female in 1968 when he was 5-years-old. In 1996, he and his brother began traveling to a remote rural area 100 kilometers northwest of Campo Grande in Corguinho, the state of Mato Grosso Do Sul, after they heard about the abduction of farmer Urandir Oliveira. Since then, Mr. Branco has researched phenomenon in the remote valley where he and many others have seen unidentified aerial craft and various types of non-human entities.